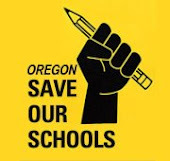 In response to Sue Levin’s commentary in the Oregonian on July 31st regarding high-stakes testing, the real question shouldn’t be how many times does a student test, but rather why have high-stakes testing at all? All of the nation’s best testing experts say that testing should not be used to make high stakes decisions. One such expert, Dr. Linda Darling Hammond, recently told the Oregon’s Education Investment Board that the world’s highest performing school systems like Finland and South Korea do not use standardized testing for any high stakes decisions. Unfortunately, many students will still be testing multiple times. Often, these students are: English Language Learners, on IEP’s, living in poverty, poor test takers, and are academically behind. Furthermore, these students are put at an even greater disadvantage because as they fail to meet benchmark, they are often put in remedial or intervention classes and lose out on elective opportunities such as art, music, and PE. They experience a narrowing of the curriculum rather than receive a well-rounded education. Students have to test in multiple subject areas. Meeting benchmark in each the first time still causes up to a month of lost instructional time, so imagine how much time is lost for a student who tests repeatedly in multiple subject areas. Students who don’t pass the test the first time spend classroom instructional minutes being pulled out to test again and possibly again. How does a teacher teach their full curriculum to all students in this environment? As a result, some schools are returning to a tracking type system where students are grouped based on skill set and test scores: homogeneous vs. heterogeneous. High-stakes testing does not acknowledge growth. Even though many students show significant growth during an academic year, they still feel like failures if they don’t meet the magic number set by the state. Testing is expensive. Rather than spending our limited tax dollars on testing, shouldn’t our monies be spent on practices that benefit every student directly: smaller class sizes, curriculum and assessments created by teachers, and investments in programs such as music, PE, art, and library media? High-stakes testing usurps a school’s technology resources to be used for testing rather than for maximizing access in the teaching of technology skills needed for the 21stcentury. The bigger problem we should be addressing is the fact that we are relying on test scores in determining the success of our students, teachers, and schools. To dismiss high-stakes testing as a “snapshot” fails to recognize the negative effects of such testing. Instead, teachers should be trusted and allowed to create and implement their own curriculum and assessments using their professional judgment and training. Student growth should be honored. Student backgrounds should be considered. Classroom communities should be respected. Students should be seen as human beings, not data points. Testing companies should be shown the door. Backlash against high-stakes testing is on the rise. Parents are starting to choose to opt their children out of taking tests at all. School districts are starting to take action by passing resolutions against high-stakes testing. Every student in this state should be guaranteed a well-rounded education. If we continue to value high-stakes testing, this won’t happen because the “snapshot” becomes the whole picture.